Like most walks of life, as a pastor, I get bombarded with all things leadership. I read books on it, go to seminars about it, and take classes that promise to help me become a better leader. Leadership is a key element of most enterprises. One of the definitions of a leader I've heard over the years is the pithy little statement that a leader is someone who has followers. In other words, you're not really a leader unless you have someone following. Thank you Mr. Obvious. And yet it seems that we easily forget this little tidbit of wisdom. Leaders often lose track of the idea of leading people and quickly begin to focus on leading an institution. In a church setting the leader begins to develop a vision of where the church needs to go, or what it needs to become, and then begins to implement a plan to get them there. That all sounds well and good but those plans often involve schedules, styles, architecture, technology, marketing, branding, and a whole host of other changes that involve the institution. What is often left out is leading people. A leader who makes a lot of institutional changes and forces people to accept those changes isn't leading, he's dictating. he may be right about those things needing to be done but if he isn't leading the people that direction he isn't leading. Now some might say they got the church leadership's approval. But that is only leading a few people who may or may not be able to challenge the leaders assumptions. In any case, the people haven't been lead as is evidenced by the fact that they aren't following. Leaders need to lead people so there is a lot of truth to that old saying about having followers. It may take a lot longer to get where you need to go but that is what true leadership is really all about. Every now and then I run across a book that I consider needs to be read at least once a year. I think I am in the middle of one right now. A Tale of a Tub is a book written by Johnathon Swift, yeah, the Guliver's Travels author. It's an odd book in that he has a lot of commentary on various topics with the story mixed in. It is quite controversial depending on how you interpret his meaning and if you find yourself in his cross hairs. Swift was an Anglican priest so I think I also have an affinity with him as a pastor. I will say that he uses a lot of words that aren't used much anymore as well as some Latin so some may find his writing in this book difficult. Having said all that I wanted to write a little summary of his section on critics. He makes three points that I find both consoling and condemning. I need to take criticism better and I need to be careful about criticizing. 1. Unlike every other use of the intellect, a critics best work is the very first thing that pops into their heads... apparently. 2. Like a rat going for the very best cheese among many cheeses, critics go for the very best work. In other words, if your work is being heavily criticized your work must be very good. 3. Dogs will circle a table looking for discarded scraps. The fewer the scraps the louder they snarl when they find one. In other words, if you are facing loud criticism it might mean that the critics haven't really found a lot to criticize. One of the issues I have been wrestling with regards whether the new emphases we see pop up from time to time are really a new understanding of faith and community or just another expression of faith and community. We have heard about healthy church, emergent church, missional church, and on and on. But my question is whether these are more about expressions of faith rather than a true change in spiritual state. In the diagram below I have tried to map my thinking. 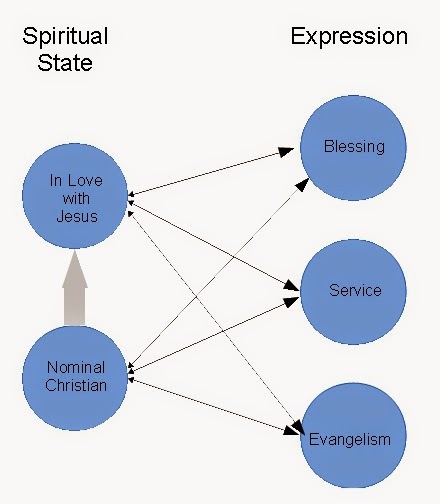 In the Spiritual State column I have tried to demonstrate that everyone who calls themselves a Christian has a spiritual state that falls on the continuum between nominal and completely in love with Jesus. In my diagram I have rather optimistically drawn an arrow showing a move to in love with Jesus. The second column represents expressions of faith. You could fill in your own here and the list would actually be much more than three. I am trying to make several points here. First it is possible for people in any spiritual state to give an outward expression of faith that may look the same as any other person on the spiritual state continuum. Just getting people to express their faith in a certain way does not really mean you have changed their spiritual state. However, I would agree with several authors who believe that such expression can lead to spiritual growth. Even someone high on the spiritual state will probably find nourishment in their faith expression. A second thought is that someone who is in love with Jesus is probably more likely to express their faith than a nominal Christian. I've met people who I found out later had a significant other in their lives. But it took awhile. I have met others whose behavior made it quite obvious they had a significant other in their lives right from the beginning. Obviously personality comes into play but people who are head-over-heels in love express it. So what do we make of all these trends like the missional church? Is being missional just an expression of someone who is in love with Jesus? If someone is in love with Jesus are they going to be missional? Are these trends simply pointing out blind spots? Like a husband who loves his wife but doesn't realize he is hurting her in some way until a friend points it out? Are some expressions of faith more likely to help our spiritual state than others? I am at that stage in my life where I often run into old friends and "catching up" has become quite common. One of the questions that is always asked is, "What are your kids doing?" I have 4 kids who happen to be in all different stages of life so I usually just give a very brief update so I don't bore then to death. (I do go on about my grandson a bit too long, probably, but I don't care.) Answering that question is not my favorite thing to do, not because I'm not proud of my kids, but because I don't feel like I do them justice and I am probably not doing a very good job of conveying how my kids are doing. I ran into some acquaintances the other day that I hadn't seen in quite awhile. We did the usual formalities of catching up but then the wife said something that got me thinking. She said how much she enjoyed watching her children develop their passions in life and went on to explain how that had played out in the life of one of her daughters. That got me thinking about what a great question that would be. "What passion have your kids found in life?" or "How are your kid's passion shaping up?" or simply "What are your kids passionate about?" For some reason that questions makes me smile. Probably because I instantly can think of an answer for each kid. With some of my kids their passions are pretty strong right now. With others it is developing. In both cases it is exciting to see as a parent and gives me, and others, a good perspective of how they are doing in life right now. So, if I get the nerve, next time I run into an acquaintance I haven't seen in awhile I am going to ask about their kid's passion. I may get some strange looks but hopefully I will get some good insight into just what is going on in the life of their kids. Over a decade ago there began yet another discussion about missional churches versus attractional churches. I have never been a big fan of the attractional model, mainly because I find it boring. But the other day I got to thinking about how damaging an attractional model can be if they draw people for the wrong reasons. If people are just there for the attraction how deeply are they falling in love with Jesus? One of the amazing phenomenon of our time is how fast the Church is growing in places where it is restricted. We hear about incredible growth in churches that have to meet secretly. That got me to wondering how these churches are growing. They probably aren't out there advertising their church with a snazzy media campaign, high tech worship service, awesome worship band, or even a clever church sign. I'm sure some may come because a friend said they should come to this cool church service but I doubt that accounts for the incredible growth. The obvious answer is that a lot of personal evangelization must take place outside the church. People in love with Jesus tell others about Jesus. These new followers are then drawn to church because of a desire for fellowship with fellow believers and to learn more about Jesus. They aren't there for any attraction other than Jesus and that probably helps them grow in their love for Jesus. I wonder what would happen if I camouflaged my church. Would it help us be more missional. Would it change how we think about church? Would it change how we live our lives outside the church? Would it help people fall in love with Jesus? Every now and then I will have someone tell me, "This has to be the hardest part about being a pastor." Sometimes they say, "This is why I could never be a pastor." It doesn't happen often but in my case it has only happened when I have been walking with someone through the crisis of a loved one passing away, especially if that loved one is a child. Those situations aren't easy but they aren't even close to the hardest part about being a pastor. Those situations can are hard because there is usually a lot of pain involved. Sometimes difficult decisions are required. Emotions are very raw and sometimes things can get awkward. But at those times I am expected to be there and most of the time I am welcomed. People are glad I'm there and appreciate the love and support. Sometimes they almost seem desperate for my presence. They want me to walk with them through those moments. The hardest part about being a pastor is caring for my soul and the souls of my parishioners. Confronting sin is seen as an invasion of a place where I am definitely not welcome. The initial response to my presence is often hostile and unwanted. Encouraging spiritual growth is viewed with the same tiresomeness as the constant drip of a leaky faucet. Eyes are averted and even my presence can be seen as something to be avoided. This is the hard part. One option I have is to avoid the hard part altogether. I can be there in those crisis moments and keep everything light and uplifting the rest of the time and everything will be fine. I just need to be harmless and I will be tolerated or maybe even liked. I'm afraid some pastors choose this path. But how can pastors live with themselves if they avoid the hard part? It seems to me that there is just no option.